Richard Petty, simply known as The King to most NASCAR fans, will be honored at the STP 400 this weekend at Kansas Speedway. This year is the 40th anniversary of the partnership between STP and Richard Petty. The number 43 car will be running the iconic paint scheme this weekend. To honor the King will be honored will be by a $43,000 donation to The Victory Junction Gang Camp by STP’s parent company Armored AutoGroup. As many fans know- The Victory Junction Gang Camp was created in honor of Richard Petty’s grandson, Adam Petty who died in a racing accident. I have talked about Victory Junction lots- it’s a wonderful children’s summer camp that serves more than 2,500 campers each year, between the ages of six and16 years old with 24 chronic medical conditions and serious illnesses, in Randleman, NC for a week of non-stop, full-throttle fun. off Aric Almirola’s race-worn firesuit signed by both Almirola and Petty. The car Aric will be driving will bear the classic Petty Blue/STP Red paint scheme that Richard made famous. All proceeds from this one-of-a-kind firesuit will benefit Victory Junction. Fans can visit http://myworld.ebay.com/victoryjunction to bid on the firesuit – a one of a kind item that will be a great addition to the collection of any race fan. Also, in honor of Richard Petty, STP is providing race-day tickets to Fort Riley and Fort Leavenworth service members, allowing them to take in all the racing action this weekend at Kansas Speedway as a thank you for their service! Also watch for a new commerical campaign staring none other than Richard Petty himself. Entitled Left Lane Club, the STP campaign will start this weekend on FOX and will also air throughout the summer. So keep an eye open for that. And congratulations Richard Petty and STP on 40 years! 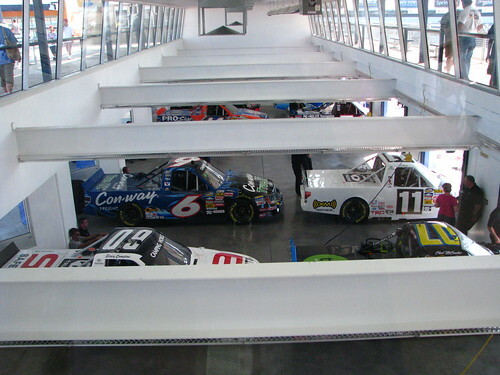 The trucks sit in empty stalls in the garage area post-practice and pre-qualifying. 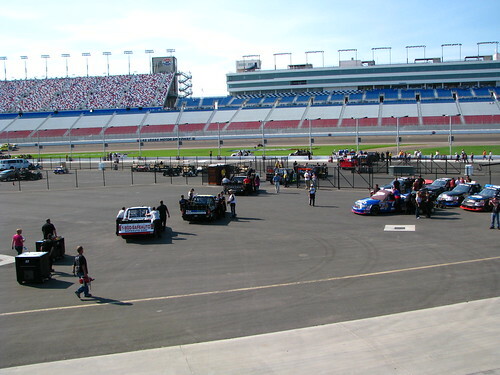 The Trucks are pushed out onto the qualifying grid. The wreckers take to the track pre-qualifying. 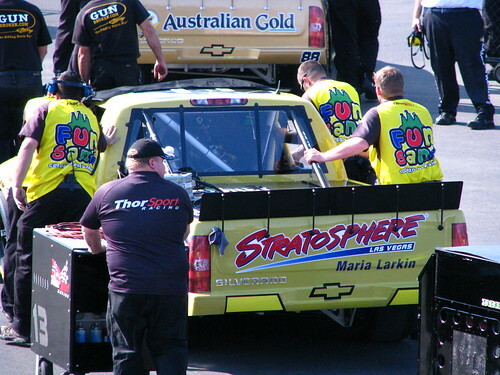 Johnny Sauter's truck gets pushed onto the qualifying grid. 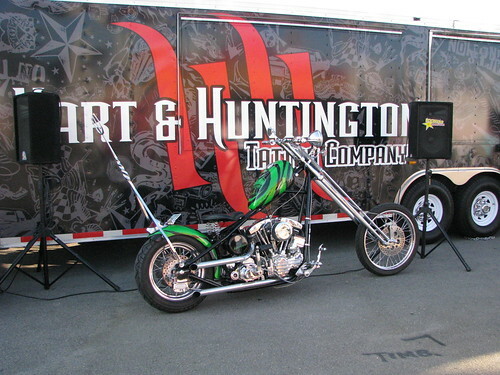 Hart and Huntington were represented at the track by TJ Bell. This is their merchandise hauler and Carey's bike. 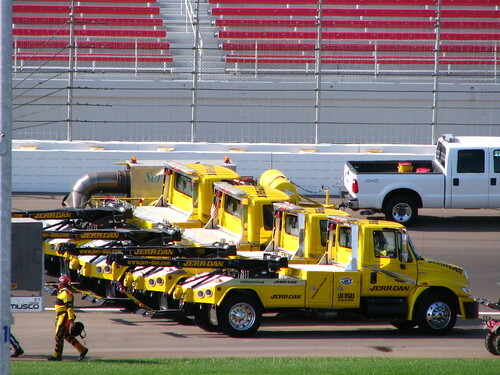 The trucks are lined up and we are ready for pre-race. The crews line up for invocation. 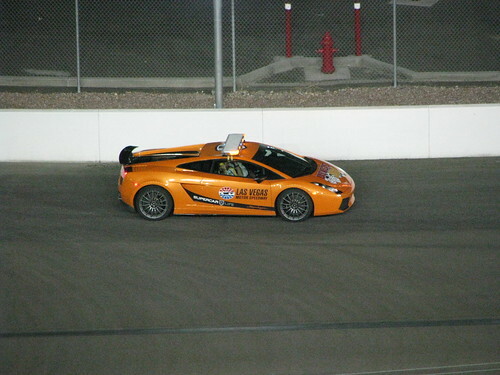 The announcer said this was the most expensive car to ever be a pace car at a NASCAR race. 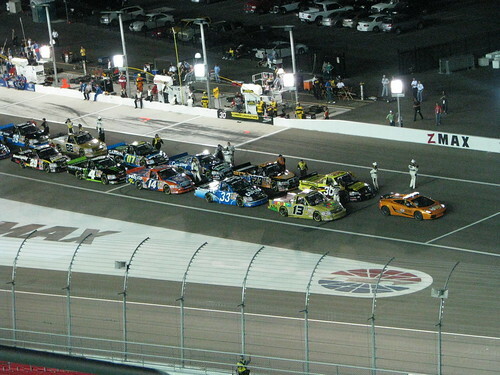 Trucks are parked on pit road during the warm up laps when the lights in turn one (including the ones in the stands) went out. Took about 20 minutes to fix. 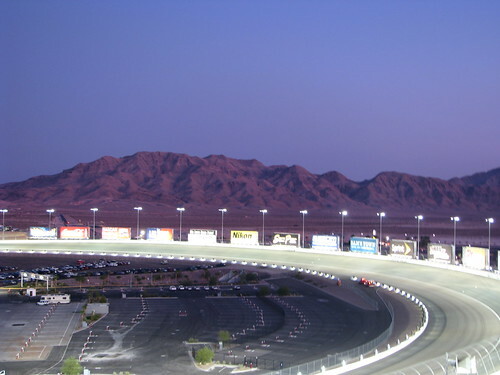 Turn Two at LVMS in the Evening with mountains as a backdrop. 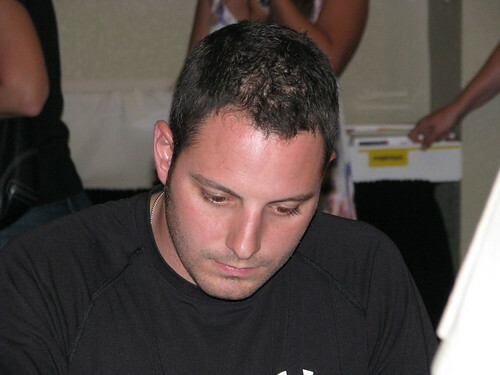 Johnny Sauter, who was the race winner. 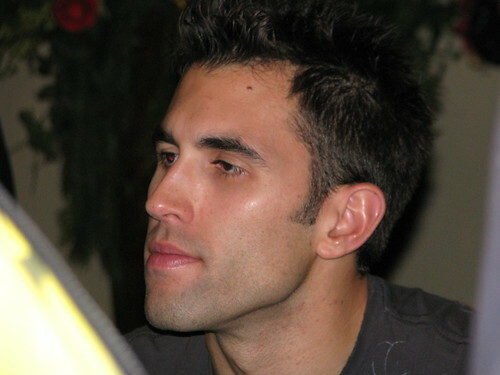 Aric Armirola was driving Kyle Busch's number 51. All in all we had a great time, but we got to the track WAY too early. Next time we will know! The 2009 Prelude may have been delayed but it was worth the wait! During the driver introduction laps Tony was thankful that the weather was perfect for racing and that most of the drivers were able to rearrange their schedules after the original June 3rd date was rained out. Missing from the lineup were Jeff Gordon, Dave Blaney, Carl Edwards, and Bill Elliott for either scheduling or injury reasons. 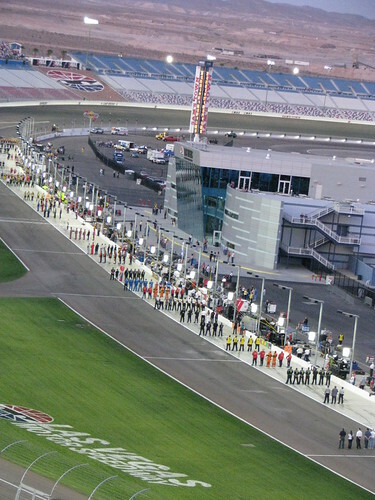 Heat race winners were: Jimmie Johnson (driving a car owned by Clint Bowyer), Kasey Kahne and Aric Armirola. Joey Logano totalled the rear end of his car during his heat race- beyond repair. He ended up driving Tony’s backup car in the Main. Denny Hamlin did not make it to the Main despite wicked fast times in the hot laps and during his heat race because of a bent valve pusher. The disappointed Hamlin was the only driver not to start the Main. During the 30 lap Main, Tony started 6th but quickly made his way towards the front of the pack, finally passing Kenny Wallace for the lead just before the halfway point. Once Tony got to the lead, much like last year, he checked out and was virtually unstoppable. The real race was between Bowyer and Wallace for second place, when Wallace spun his tires on a restart and Bowyer ran into the back of him, cutting his tire. 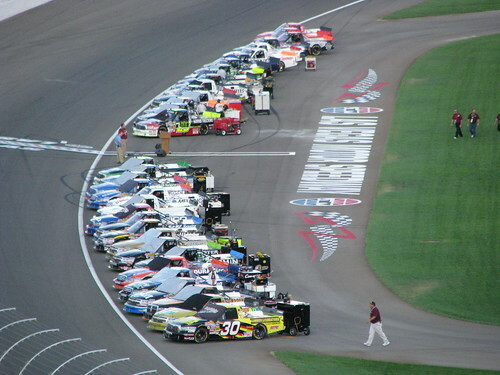 The racing was close and fast and fun on the TV I can only imagine what going to the race was like in person! Again all the money raised from ticket sales, pay-per-view fees will be split evenly among four military charities that support wounded soldiers and their families. If you want to help but weren’t able to make it to the prelude or watch it on pay per view, you can donate using your cell phone by texting PRELUDE to 90999. The donation will be $5.00 and will be added to your next cell phone bill. Clint Bowyer may not have gotten the win that he wanted- but I think he should get a special prize for having the shiniest race car! That #33 car was GOLD as in Metallic. It was actually quite pretty and I have never been a fan of gold (cars or jewlery). Joey Logano trashed his car…and then crashed Tony’s back up car. Good think Tony didn’t need it. But in his defense when he was driving he was doing pretty good for the most part. Until he hit the wall. Speaking of hitting the wall, too bad Jimmie hit the wall- he seemed to be a real contender until he did that. I can’t wait until Next Year’s Prelude.